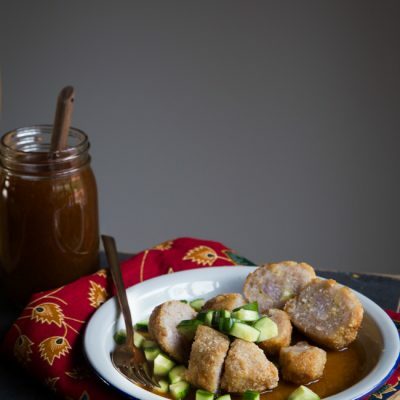 Learn how to make Pempek Ayam Saus Cuko (Savory Chicken Cakes with Sauce) with this easy to follow step-by-step guide. 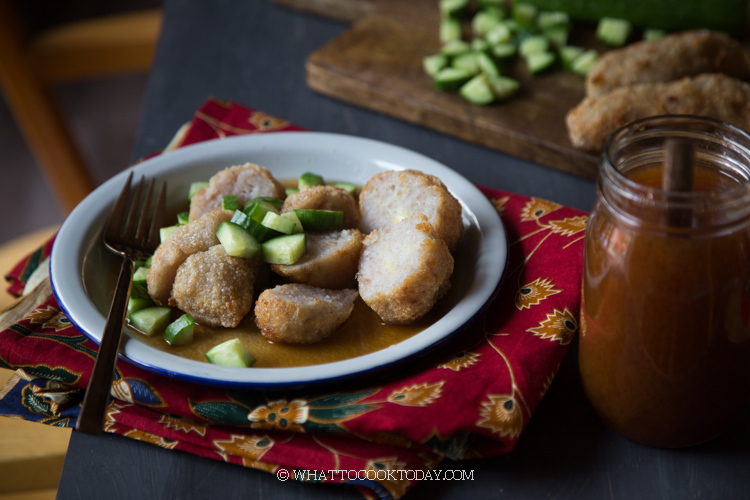 A twist from the classic fish pempek. 1. WHAT IS PEMPEK PALEMBANG? 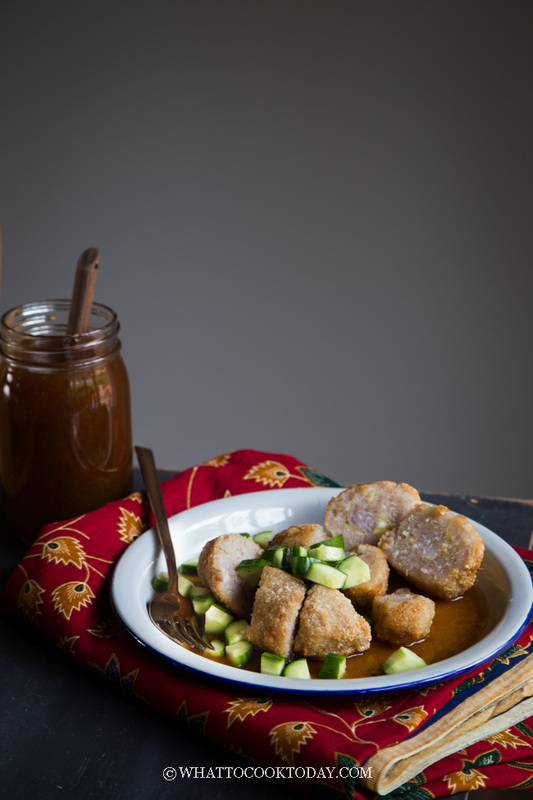 Pempek is also known as mpek mpek or empek empek is said to be in South Sumatra, Palembang to be exact. Palembang is known for its seafood dishes because of a river nearby. This dish is believed to have a Chinese influence and created by an Indonesian Chinese, an adaptation from ngo hiang. But there are several different stories I’ve heard about how this pempek came about. The traditional pempek is made with fish, usually ikan tenggiri (wahoo/mackerel), but can be made with other white flesh fish like yellow tail, snapper, etc. The fish is deboned and skin removed and then grind into paste-like consistency and mixed with tapioca starch to form a dough. The dough is shaped and then boiled until cooked and then briefly deep-fried and served with spicy,sweet, and tangy sauce known as saus cuko. 2. WHAT DOES THE NAME PEMPEK MEAN? I can’t tell you for sure, but some said that pempek was created by an old Indonesian Chinese guy, usually refer to as “apek” in Chinese dialect and hence the name pempek, kinda a short of apek! Pempek lenjer: Pempek is shaped into logs like the ones I did here. Pempek kapal selam: Pempek is shaped similar to kapal selam (submarines). Usually there is egg wrapped inside the dough and then the dough is molded around the egg and shaped like submarines, and hence the name. 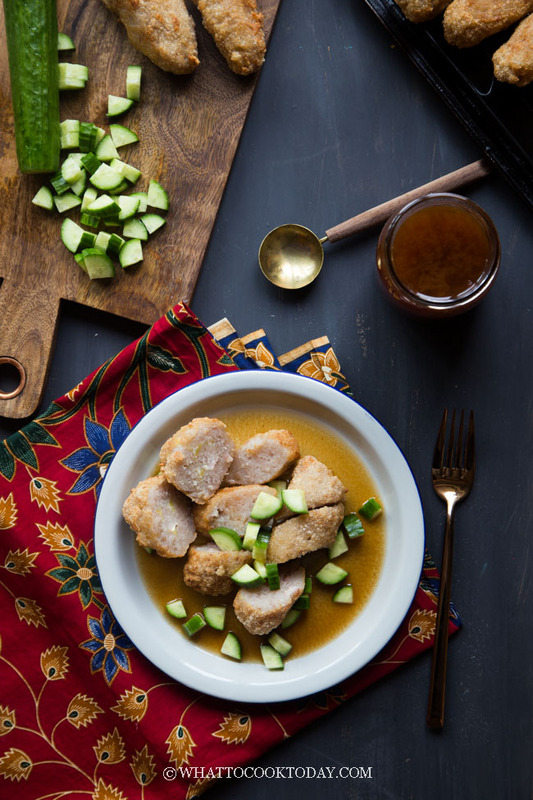 It is basically the same concept as the traditional pempek made with fish, but just substitute with chicken meat. That’s all! It’s more economical for some folks and that’s why pempek ayam is popular too. 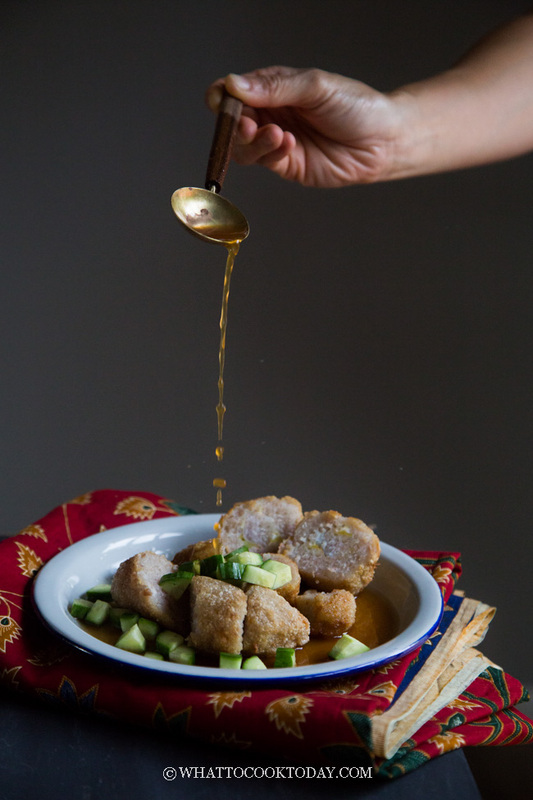 Pempek usually is made with fish/meat paste and then mixed with almost an equal amount of tapioca starch. Tapioca starch acts as one of the binder and so that the pempek can hold its shapes better. I’ve tasted pempek that mainly “dough” and not much flavor, super chewy and tough! 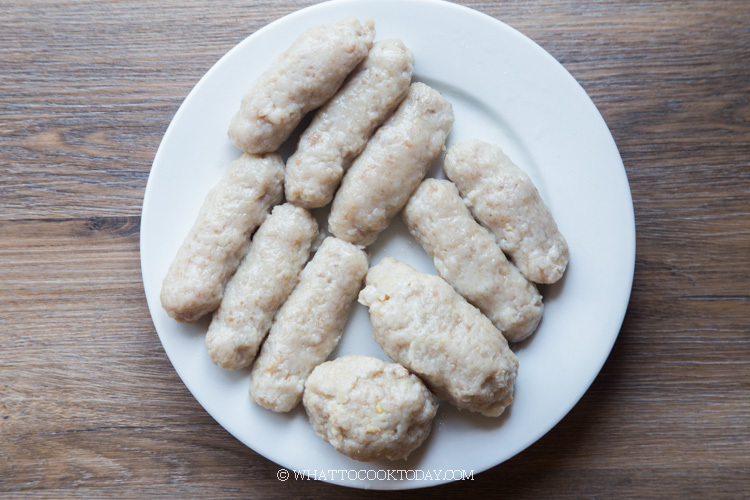 This recipe has has the right balance of the taste of the meat without overly starchy. The pempek dough is easy to work with without being too mushy either. So are you ready to get going? 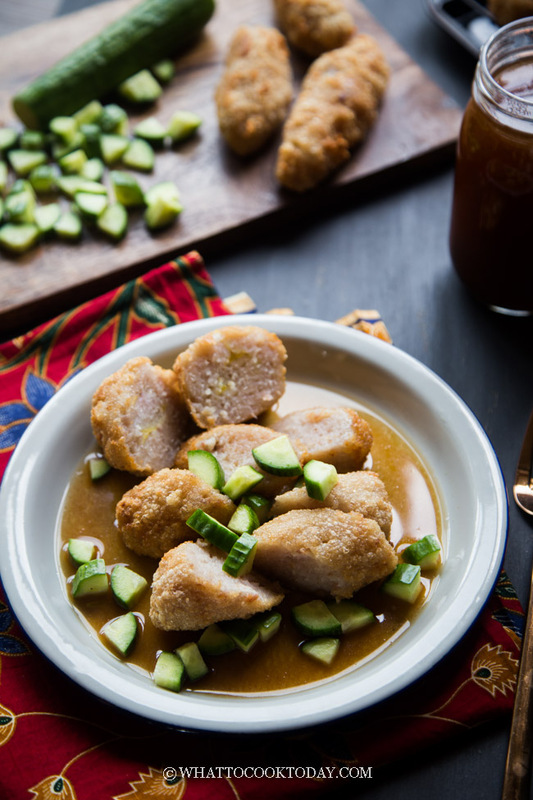 Here’s your complete step-by-step guide from how to make the pempek from scratch, how to cook them, how to prepare the saus cuko, how to serve them, and how to keep leftover pempek saus cuko. I use about 500 gr of meat and close to 400 gr of tapioca starch. I like to cap it at that amount for the starch because if you keep adding the starch, your pempek will taste more like plain dough and lacks flavor. 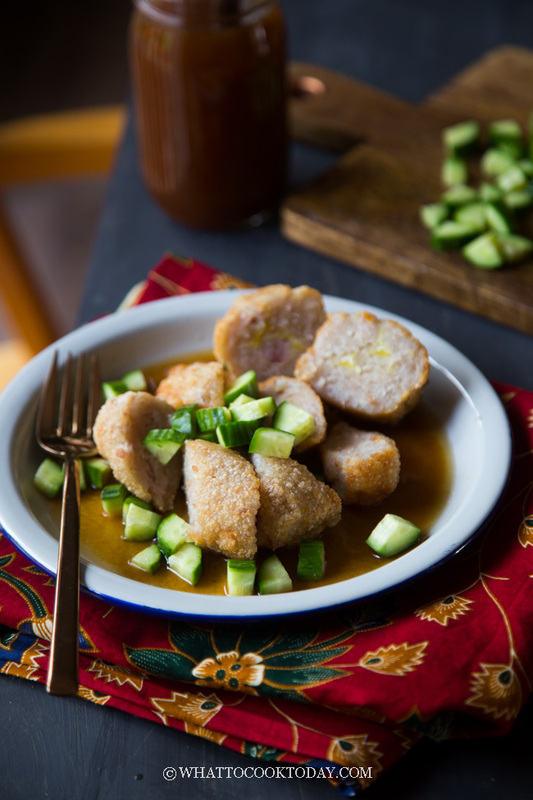 Pempek usually is boiled until cooked and then briefly deep-fried to create that crispy layer on the outside. 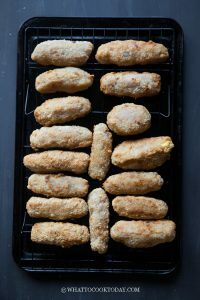 There is also method where some people cook the pempek by just deep frying and no boiling. This will work, but will be greasier and take a bit longer to cook. Once you have boiled the pempek, let them cool down and than wrap them individually with plastic wrapper, place in freezer bags. They can be kept for 1-2 months in the freezer. 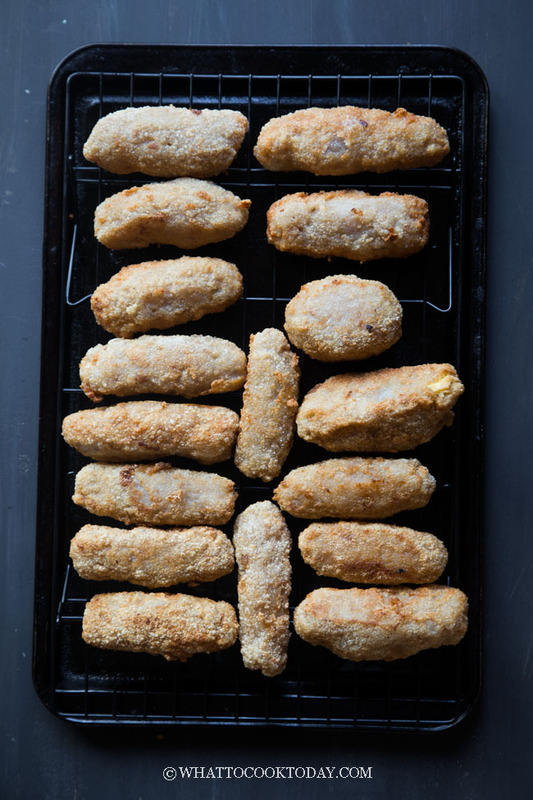 When ready to serve, thaw the night before in the refrigerator and then fried the next day. Bring a large pot of water to a boil. When the water is rolling boil, add a small pinch of the cake and let it cook. Have a taste. Adjust the seasonings by adding more salt if needed. If you are happy with the taste, proceed to cooking below. Oh my, deep fried or not I could eat this now for breakfast (although I had just had breakfast). 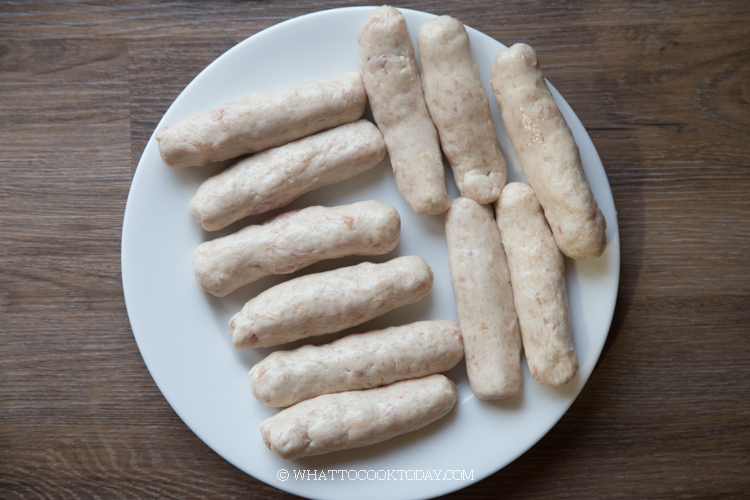 Is tapiocan starch the same as tapioca flour? The only kind of tapioca I can buy here is called flour, so I am not sure. It looks and feels almost like corn starch though. Hi Marvellina I come across your blog and love how you put so many Indonesia recipe so simple easy and turns good, thank you for doing this. I have a question can I just do grounded chicken from store instead of Chicken breast meat?